I’ve shot oodles of engagement sessions and weddings all around Collingwood and think it’s time I share my favourite wedding venues for those of you on the hunt! Collingwood is a unique area, I love the variety of photo locations from the famous waterfront to the mountain tops to the countless fields, old ruins and even the classic architecture of the downtown core. The wedding venues I’ve listed below are in no particular order and each offer unique facilities along with top-shelf staff. 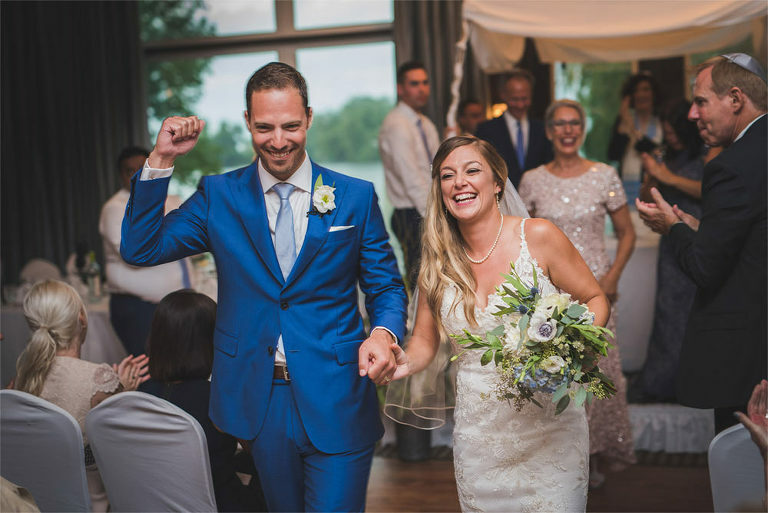 Living Water Bear Estates and Blue Mountain are the more well known locations however I had a wedding at Oslerbrook Golf and Country Club not too long ago and was very impressed by the grounds and clubhouse so it’s the newest member to my list. Cranberry Resorts Bear Estate wedding venue at Living Water Hotel in Collingwood. Imagine the subtle summer breeze coming in off the water as your guests watch you say your I Dos at Bear Estate wedding venue in Collingwood. In fact, Cranberry Resort’s Living Water Bear Estate is Georgian Bay’s only waterfront wedding venue – true story. It’s also able to accommodate up to 220 guests indoors. Behind the main building is where you’ll find their outdoor ceremony location that looks out onto Georgian Bay as well as their massive willow trees. As part of the Cranberry and Living Water Resort facility they handle weddings through all four seasons. I’ve shot weddings here in both winter and summer and whether you have your ceremony outdoors on the water or inside their main hall – it’s wonderful. Your guests will love the Living Water hotel and the whole resort is within a few minutes drive to many of my favourite photo locations in Collingwood. Check out one of my recent weddings at Bear Estate then contact their wedding team at 1-800 -465-9077 extension #251. Pro Tip: Get ready at the Living Water Resort right on the same grounds at Bear Estate so it’s an easy walk to your ceremony and even more important – an easy wobbly-walk back to your rooms after the party ends. 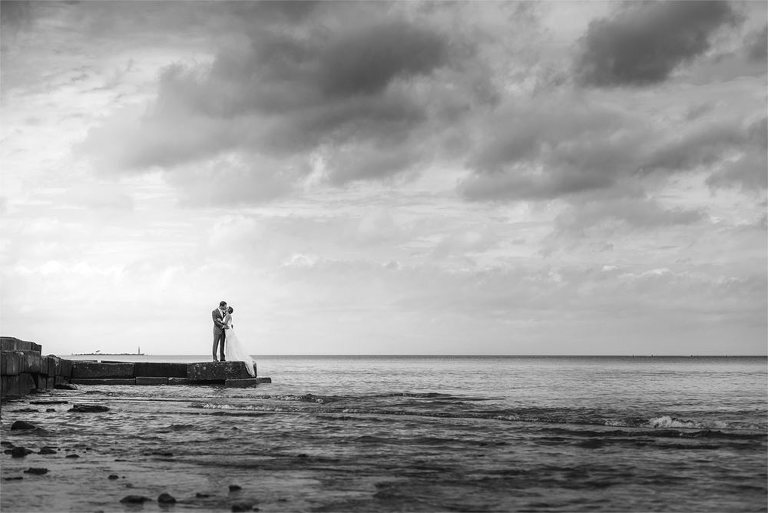 Collingwood has some of my favourite locations for wedding photos. 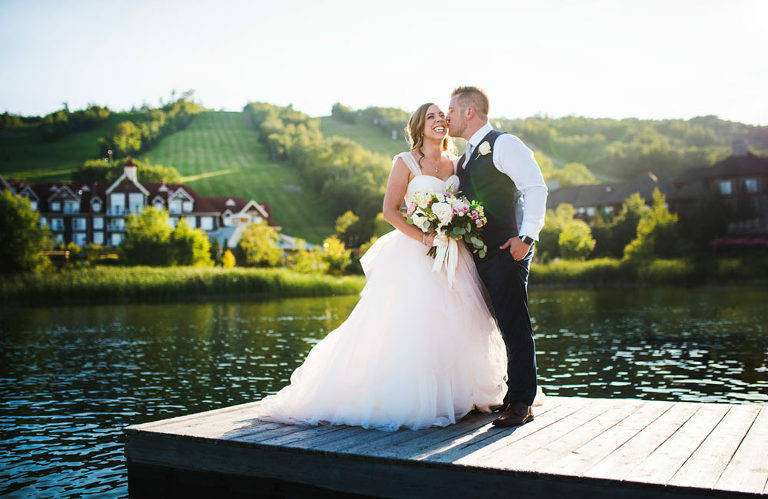 Blue Mountain is one of Ontario’s most popular destinations and one of the best wedding venues in Collingwood. 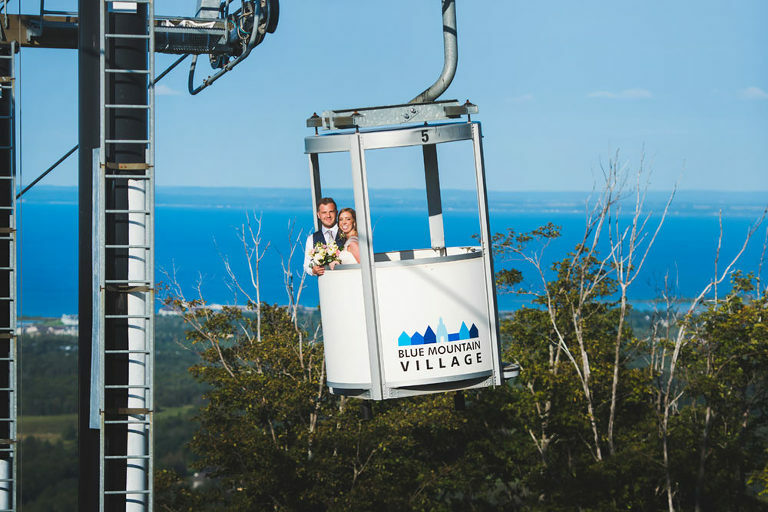 With countless tourist attractions, multiple hotels and fantastic views of the Niagara Escarpment and the southern shores of Georgian Bay – Blue Mountain Village should be very high on your list of venues to consider for your wedding. Your wedding options are endless here, they have so many photo locations, multiple indoor facilities and outdoor ceremony locations to choose from. 1. Village Conference Centre: This Conference Centre features views of the mountain and is located just steps away from the rooms, restaurants and village itself. The conference centre as high ceilings, rustic open trussing and floor-to-ceiling windows. Mountain Top Ceremony: To treat your senses and your guests, consider Blue Mountain’s mountain top ceremony location. The beautiful, scenic view created by the natural landscape of the Niagara Escarpment Georgian Bay will take everyone’s breath away. And once the ceremony is over everyone can enjoy a ride down the gondola which delivers you right back into the heart of the village. Contact the wedding team at Blue Mountain at 1-877-445-0231. My first visit to Oslerbrook Golf Club sold me on its awesome backdrop for a wedding. It’s nestled into 230 acres of the deep green of the Niagara Escarpment and the beautiful blue of Georgian Bay. It boasts a 12,500 sq. ft. soaring timber, stone and glass clubhouse perched high overlooking the manicured lawns and gardens. The large stone fireplace is especially impressive. The large terrace is perfect for mingling guests to catch the fresh Georgian Bay air. For photos, the rolling hills and short/tall grass combinations are ideal. Check out my recent Oslerbrook Golf Club wedding.